A very attractive and colorful member of the Kale family. 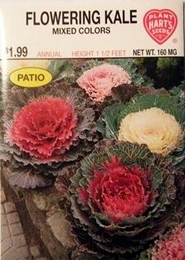 Heads have heavy fringed leaves that resemble regular kale. Very showy as a border plant in pots or tubs. Colors range from magenta, rose, pink to yellow and white with darker green-blue edges. Plant in June or July for fall and winter color. Best color develops in cool weather.